Open everyday except during annual closure. No time limit for the use of the hot bath ! 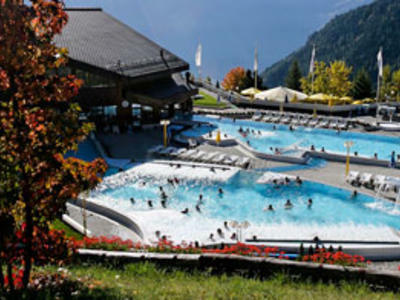 1 indoor thermal bath 2 outdoors thermals bath 1 whirlpool + 1 pool for small children 1000 m2 of SPA for everyone over 16 years old. 3 indoor relaxing rooms 1 refresment bar with cold and hot meals 250 free of charge reclining chairs with more than 3'500 m2 of lawn to sunbathe. Playground for children (summer). 1 wellness and beauty department.